Switzerland is one of the most developed countries in the world, with the highest nominal wealth per adult and the eighth-highest per capita gross domestic product and it placed second rank in the world for quality of life. Switzerland is remarkably known for good quality education and boasts a great many higher education opportunities. It is one of the world’s leading investors in education with knowledgeable minds, continuous research are the main and most valued resources in the country. The most popular of the educational facilities for foreign students, are the Swiss Hospitality Schools which is located in various towns and cities. Switzerland has more than 100 Nobel Prize winners. The Swiss economy has been very stable over the years. Its GDP per inhabitant is higher than in most industrialized countries. Swiss population enjoys a high level of living and higher learning institutes give students a very global outlook and politically neutral understanding of life. World Recognized: Switzerland is recognized the world over for its excellent education system and attracts thousands of foreign citizens every year for studying different subjects. The Swiss universities offer graduation degrees, masters and doctorate in various subjects. The most popular of the educational facilities for foreign students, are the Swiss Hospitality Schools and Management Schools. High quality education: The country has the highest number of patents registered in its name among all the European countries. Moreover, the country also boasts of the maximum number of Noble Prize laureates. The Universities in Switzerland are mostly aided by the government and the fee is reasonably low unlike other countries. 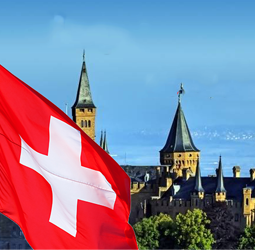 Stable economy: The economy of Switzerland is one of the world's most stable economies. Its policy of long-term monetary security and political stability has made Switzerland a safe haven for investors, creating an economy that is increasingly dependent on a steady tide of foreign investment. Since 2009, Switzerland has topped the overall ranking in the Global Competitiveness Report of the World Economic Forum. Business hub: As a European business hub, several courses have links with locally based businesses that cannot be beaten. Due to its favorable business and living environments, Switzerland is also home to an increasingly large number of European company headquarters. Renowned for innovation: Switzerland is one of the highest spenders on research and development in the world and it is not only one of the world’s most innovative research nations, but also one of the most competitive and is world leader in per capita R&D expenditure. Bologna system: All the universities in Switzerland provide their courses based on the Bologna system. According to this system, the undergraduate studies are further culminated into a bachelor's degree, which can be further advanced to a Master's degree and then to the PhD programs. All these educational programs are designed for a variety of areas and cutting-edge research and technology. Multi-Cultural and languages: Switzerland, being situated in the heart of Europe, is the crossroads of several languages and cultures. It has people from all over the World, which give you Opportunity to interact with students and scholars from different parts of the Globe and gives international exposure or learning environment with four native languages including French, German, Italian and Romansh, Switzerland offers multilingualism like no other. Learning opportunities: The teaching and administrative facilities in institutions are at par with the international standards and offers high-class quality learning opportunities. Switzerland, is the top most ranked country in high standard of living as well. Some universities specialize in banking, machine tool and engineering while others have expertise in chemical and pharmaceutical engineering. The structure of Switzerland’s system begins with primary education, then a lower secondary education followed by an upper secondary education, which may even include vocational training. The higher education system at University-level consists of ten cantonal Universities, two federal Institutes of Technology and eight Universities of Applied Sciences (Fachhochschulen), with 20 universities of teacher education and many Advanced Vocational Colleges. Private universities only offer postgraduate studies. Switzerland is well known for its advanced business education system with a number of world-class universities and MBA programmes. More than 50,000 international students, comprises 20 percent of the country’s total student population prefer to study in Switzerland. Although there is The State Secretariat for Education, Research and Innovation (SERI) which is the associated body responsible for the education in Switzerland, the 26 cantons have the major responsibility for the same and run their own education systems. Each canton has a separate calendar, curriculum, and methods of teaching of their own. Education in Switzerland is very diverse. It is also a country renowned for scientific research hosting the world’s largest laboratory. Switzerland offers plenty of options for higher studies in universities, including schools for applied sciences as well as business and management also. Some of the common areas of study include international affairs, economics, engineering, computer science, finance, communications, and international business management, natural science, banking, healthcare, theology in conjunction with degree programs, certificate programs or professional development. Pursuing studies in Switzerland, gives option to choose from full-time or part-time studies to meet their individual needs. Switzerland is an expensive place and accommodation cost varies according to location, neighborhood and type of building. There is wide variety of safe and modern accommodations offered to students in on campus or off campus. University residence– international student usually receive a subsidized price for housing on campus. The advantage of living on campus is that you will live close to college facilities as well as other students. You should apply for student housing as soon as possible since places are limited. Rent/share an apartment– Many Students choose these option (Private, rented accommodation) as they have want to live with Swiss students and it is a great way to throw yourself in the deep end and be fully immersed in the language and culture. If you are renting a property, then you have to follow some legal formalities. Home stay– some international students prefer to stay in the house of a Swiss family, to truly experience the Swiss culture and integrate with the Swiss people. Switzerland’s, high standard of living makes it expensive however living costs in Switzerland for students will also differ according to city and university. Switzerland academic year is divided into two semesters first fall semester runs from September through December and second spring semester runs from February through June. Although application deadlines for studies in Switzerland vary depending on the study program and the university or college, students are usually required to submit their applications in the spring semester for studies beginning the academic year. For Switzerland study visa first you need to find out what type of visa you required “C VISA” or “D Visa”. If you are looking for a course that is last longer than three months, then you need “D Visa”. In order to apply at a university or equivalent, first you must find a course and get accepted into it. Once you have confirmation that you have a place (a certificate of enrolment), you can apply for a visa to study in Switzerland. For visa you may required some document such as application for long stay visa filled and signed, photographs, valid passport, Letter of acceptance from Swiss institution, health insurance, proof of fees payment and sufficient fund to stay in Switzerland during studies, CV, motivation letter, commitment to leave Switzerland after studies and many more. Make an appointment for visa interview in the Swiss embassy, as early as 6 months prior to studying in Switzerland but no later than ten weeks before your departure. There are so many documentation and important things that you need to do before departing for studies in Switzerland institution. Acceptance of Offer letter from institution. Obtain passport and student visa (for non-Europeans). Check the visa requirement & Documents. You will require residence Permit in Switzerland. Purchase health insurance / Medical cover. Note address & phone number of Institutions and your accommodation. Photocopy all important Documents (visa, passport, birth certificate, insurance coverage, travelers cheques, prescription medication, permanent ID/driver’s license, etc) leaving a second copy at home or make a scanned copy of the above information that you can access through your email. Set up a Swiss bank account to make your transaction easy. Have enough cash in Swiss currency to get you through the first few days. But their common languages also change.